Using Menus in WordPress can seem a little confusing at first, but the menu system in WordPress is quite flexible and easy to use once you get the hang of it. 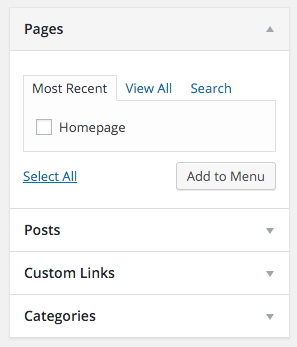 To get to the menus area in the WordPress admin click on Appearance > Menus. From here you have the option to edit an existing menu or create a new menu. Click on the link that says create a new menu. In the menu on the left of this page, there are options to choose from regarding what you can add to this new menu. Click the first option “Pages” to expand a list of pages that can be added to the menu. To add a page to the menu, put a check beside that page and click the “Add to Menu” button. You can do this for as many pages as you need to add to the menu. If you have a lot of pages to choose from, a quick way to locate a specific page is to click on the “Search” link and type in the page you want to add. Pages can be ordered here by clicking on a page and dragging it to the desired position. 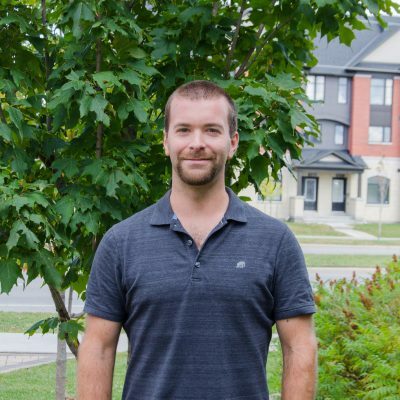 You can also use this technique to create a page hierarchy (or sub menu) by dragging a page underneath and slightly to the right of another page which will become its parent. Click the “Create Menu” button when completed. You can use steps 2-4 above to make edits to an existing menu. To edit an existing menu, select the menu to edit from the dropdown list and click the “Select” button. Click the “Save Menu” button when completed. Click on the “Custom Links” option rather than “Pages” as above. Fill out the “URL” field with the link to the external resource. 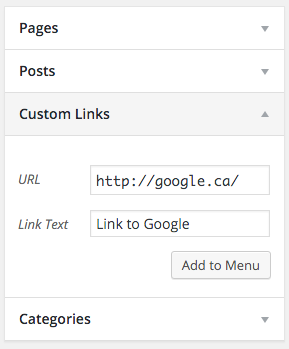 Fill out the “Link Text” field with the name for this menu item as you’d like it to appear in your menu. Click on “Screen Options” at the top right of the screen. Click the “Save Menu” button when completed. Finally, your theme will have options under “Menu Settings” at the bottom of this screen called “Theme locations”. To have your menu appear on the site, assign it to one of the existing theme locations by putting a checkmark beside the theme location. Click the “Save Menu” button when completed.